*NICE PRICE! * Amazon – WDF 60PCS Heavyweight White with Gold Rim Wedding Party Plastic Plates,Dinnerware Sets,30-10.25inch Dinner Plates and 30-7.5inch Salad Plates (White/Gold Diamond) just $18.99 after NEW $2 Coupon! NEW $2 coupon! 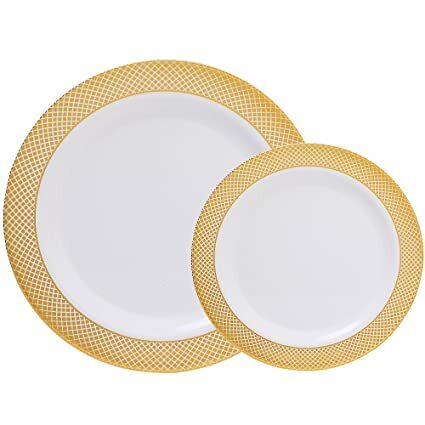 Score the WDF 60PCS Heavyweight White with Gold Rim Wedding Party Plastic Plates,Dinnerware Sets,30-10.25inch Dinner Plates and 30-7.5inch Salad Plates (White/Gold Diamond) for $20.99 – $2 coupon on the product page = just $18.99 with FREE prime shipping or free shipping with $35 purchase on Amazon!